Deviled eggs will always remind of my Grandma. 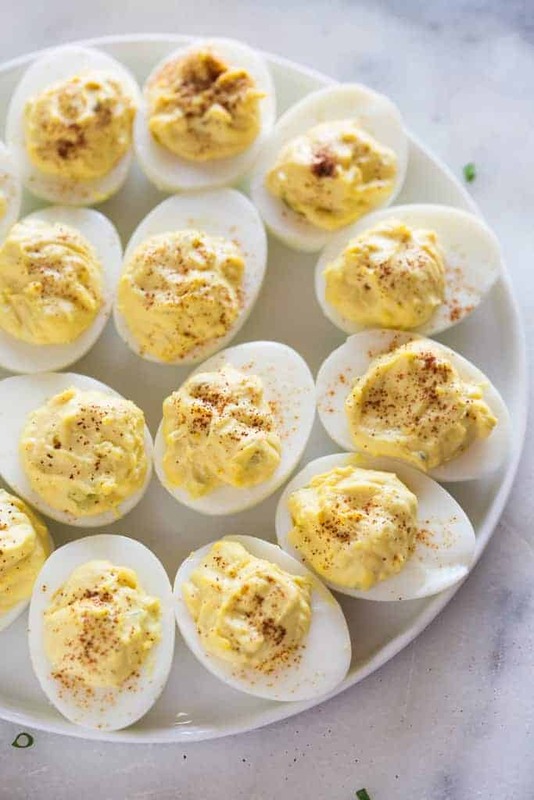 At every family party — especially our Easter party — my Grandmother would always bring deviled eggs because she knew they were my absolute favorite! They are so simple and delicious. I’ve tried different versions, like these guacamole deviled eggs, but nothing is better than a traditional deviled egg! To make deviled eggs, you need to start by hard-boiling a dozen eggs. There are many different methods for hard boiling eggs. I have found that the instant pot makes perfect hard boiled eggs that are extremely easy to peel. If you don’t have an instant pot, boiling works great too. Eggs cooked on the stove-top take 12 minutes. Egg’s cooked in the instant pot cook for 5 minutes with a 5 minute natural release. Eggs cooked in the oven bake for 30 minutes. To make hard boiled eggs in the instant pot, add one cup of water to the Instant Pot. Add the wire rack insert, and lay your eggs on top of it. Cook the eggs on high pressure for 5 minutes, with a 5 minute natural release. Remove the eggs and place them in an ice water bath for 5 minutes. 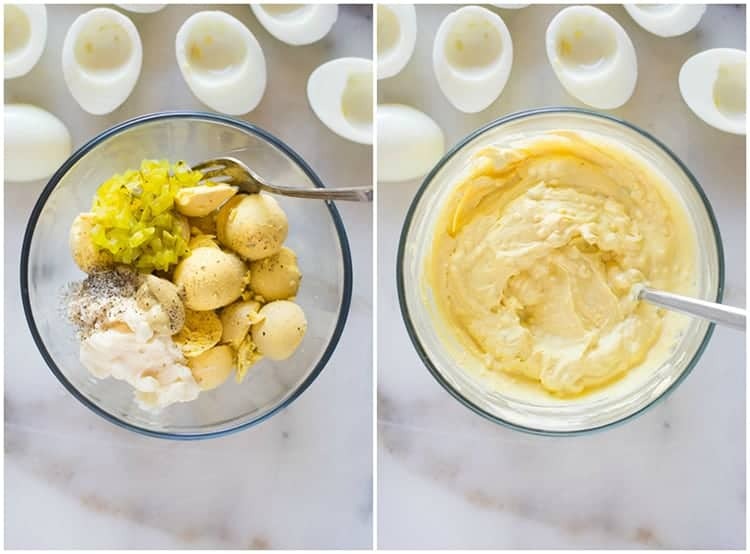 These instant pot hard boiled eggs turn out PERFECT every time. Preheat oven to 325 degrees F. Place each egg in the cup of a standard muffin tin. Bake for 30 minutes. Remove the eggs and place them in an ice water bath for 10 minutes. Bring a large pot of water to boil and add 1 teaspoon of baking soda to the water (this is the best trick for helping the eggs to peel really easily). Use a slotted spoon to gently lower the eggs into the water. Touch the spoon to the bottom of the pan and then allow the egg to gently roll off into the water. You should boil the eggs for 15 minutes. Then drain the water and run cold water over the eggs for 1-2 minutes. 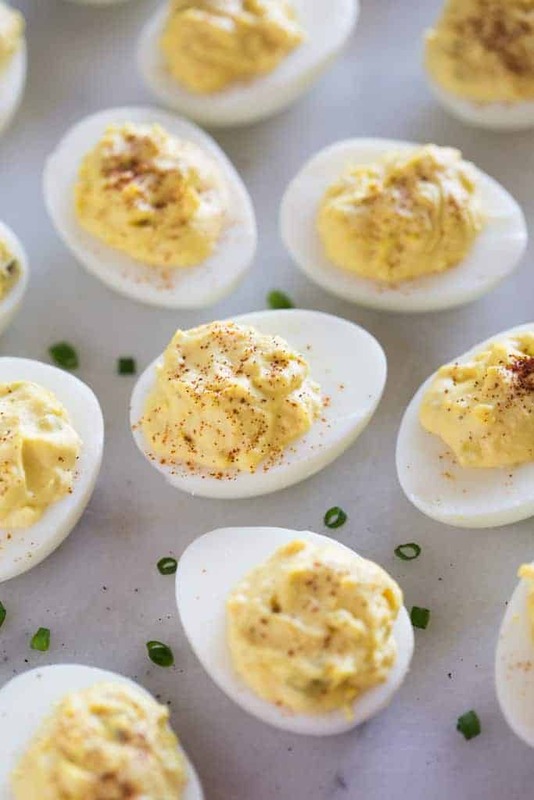 You can make deviled eggs ahead of time by making the hard boiled eggs, making the filling, and storing the eggs and filling separately for up to 3-4 days. 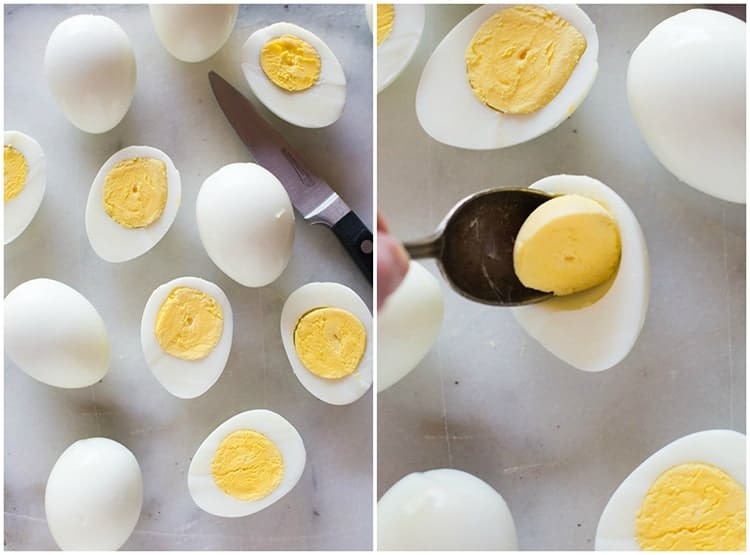 Fill the eggs with the mixture right before serving. You could also make the deviled eggs completely, and they will keep for up to 3-4 days in the refrigerator. Once your eggs are cooked, remove the shells. Use a knife to slice them in half, lengthwise. Use a small spoon to gently remove the egg yolk from each egg and add it to a mixing bowl. Add mayonnaise (I like to use plain greek yogurt and mayonnaise), relish, mustard, and salt and pepper. Mix everything together until it’s relatively smooth. Taste the mixture. You can really tailor it to your liking at this point. Add a little more relish, mustard, mayo or yogurt. Add some more salt or pepper, until it tastes just right. Add a generous spoonful of the mixture back into the egg halves. Refrigerate before serving. Sprinkle with paprika just before serving. Traditional Deviled Eggs with just five main ingredients that are quick and easy to make! These are perfect for any type of party. Cook the eggs. See note above for directions for boiling, baking or using the instant pot to cook perfect hard-boiled eggs. Peel the eggs and then cut them in half, lengthwise. Carefully remove the yolks and place in bowl. Stir together the mayonnaise, pickle relish, and mustard. Mash with a fork until smooth. Add salt and pepper, to taste. Add more mayo , Greek yogurt or mustard, to taste, if needed. Add a big spoonful of filling back into each egg white. Store in fridge for up to 3 days. Garnish with a sprinkle of paprika just before serving. See tips for making perfect hard boiled eggs and tips for making ahead of time in the post above. These deviled eggs are about 90 calories each. I originally shared this recipe March 2013. Updated March 2018. I followed the recipe exactly (cooked them in my instant pot) and they turned out perfect! We had an early Easter dinner with my parents and everyone loved them. These are delicious! I love how creamy the yoke mixture is. 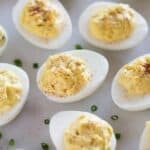 For deviled eggs, this recipe is absolutely perfect! Do you put cinnamon on it but just sprinkle some at the end on the eggs? My secret ingredient is Ranch Dressing. I add a couple of tablespoons and use a bit less mayonnaise ! Thaanks, going to try this! How long do I need to store them in the fridge before serving? Hi I’m from Trinidad and would love to try making this…. but my husband isn’t a fan of pickles can I substitute it with bacon instead?? ?